I’ve got a fun giveaway to share with you today! I’ve teamed up with the nice folks over at JewelMint to give one lucky reader a credit for any piece of jewelry you would like on JewelMint… and boy do they have some good pieces right now! Hop on over and check it out (after you enter this giveaway, of course). Personally, I hate it when people have a contest or a giveaway that makes you jump through 20 flaming hoops, visit 35 sites, and then leave 23.6 comments while playing polo in the rain… so this giveaway is going to be sweet and simple. Three easy steps and you’re done! Lets get started, shall we? 1. 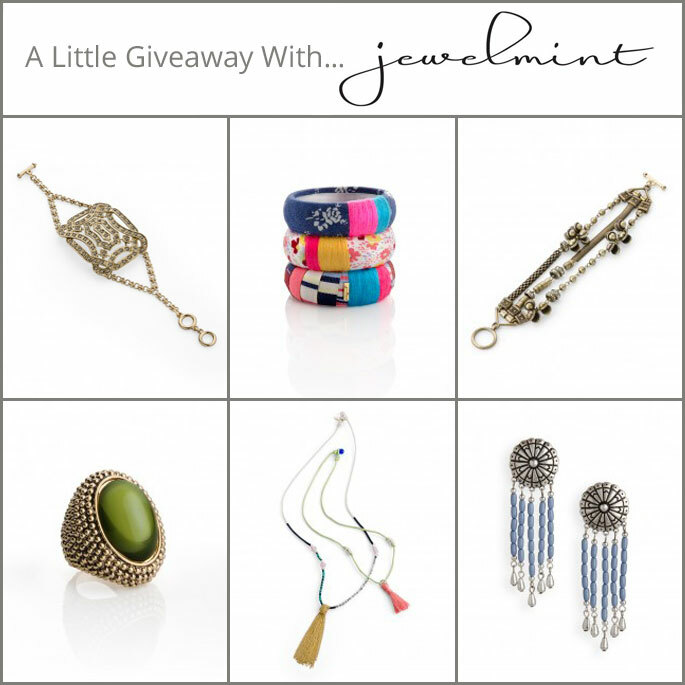 Sign up for a free JewelMint account here, if you havent already (you’ll need it if you win). 2. ‘Like’ JewelMint on Facebook here, if you haven’t already. 3. Leave a comment below with your full name and tell me about your favorite piece of jewelry (can be from anywhere). Simple, right? You’ll be able to enter until Friday, October 28th. I will select a winner at random that weekend and announce the lucky lady (or gent!) on Monday, November 1. My favorite piece of jewelry right now has to be the vintage rhinestone choker I recently purchased. I signed up for JewelMint and liked them on facebook. My favorite piece of jewelry is a rhinestone bracelet given to me by my grandmother, It was her’s when she was my age. Thanks for having this giveaway, I hope I win! Yay! I love Jewelmint! I picked up the link from your contest from their wall during a study break. My favorite piece of jewelry has to be a pair of earrings I have that are gold roses with pearls in the middle. Pearls and roses are both connected to the month of June (my bithday!) and so I’m a sucker for anything rose/flower and pearl related. Obviously I positively *pounced* on the Calla Lilly earrings when i saw them, and I love them too! My favorite piece of jewelry is a turquoise cocktail ring my late godmother gave me before she passed away. It’s a constant reminder of her and it’s my favorite stone! I love my Jewelmint pieces, but my favorite piece of jewelry is my Kate Spade Love Notes Ring. It is the perfect bow ring. It is so cute but understated at the same time. I love it! So excited and thank you for hosting!!!! New Day, New Shoes Challenge! My favorite piece of jewelry is actually from Jewelmint! I LOVE the Payal Belle Bracelet! Its so versitile and has a boho feel. Its definitely a must have! My favorite piece of jewelry is a heart pendant on a gold chain that was given to me by my parents when I was 11. It is close to my heart and makes me feel warm and loved every time I put it on. My favorite piece of jewelry is my wedding/engagement ring set! My JewelMint Forever Audrey earrings are my second fave since they compliment my rings perfectly! I love JM and have bought more pieces than I’d like to admit in my first 3 months since joining. But my favorite by far is Poseidon. Such a unique well made piece that really takes a plain top and makes the look special. The piece I’ve worn daily for several years: the diamond stud earrings my parents gave me when I graduated university. They go with absolutely everything, can be dressed up or down, and are both simple and elegant. My very favorite piece of jewelry is my wedding ring and my second favorite is my metal mosaic ring from Jewelmint! Thanks for having this contest – Good Luck everyone!! Wow, picking just one favorite piece of jewelry is nearly impossible! From JM, I would say it’s a toss up between the Sierra Bracelet and the Mumbai. Both are so well made and versatile. I love them and wear then together and alone often. My actual favorite is my mother’s original wedding ring, very thin and very worn. She passed away and I have the ring on a necklace that is either around my neck or in my purse always with me wherever I go. My favorite piece of jewelry is a vintage sparrow necklace I got from Salvation Army. It’s so unique. Now that I’m a Jewelmint member, I love wearing earrings and bracelets. My favorite piece of jewelry at the moment is JM’s Mumbai bracelet. It’s great for everyday and I think I pretty much wear it everyday. Totally a must have in anyone’s closet in my opinion. I love JM’s Mumbai bracelet. Looks great dressed up or down. My favorite piece of jewelry is just a simple amber ring I got one year while we were skiing, I pretty much wear it everyday and it seems to go with everything! Love jewelmint, I is addictive and I can’t wait to see what them come up with every month. I love JewelMint. My first piece was the “here to eternity” necklace and I absolutely love it. It is such a statement piece and goes with almost anything! Thanks for doing this giveaway! I love Jewelmint! My favorite piece of jewelry is the Payal Belle bracelet from Jewelmint.. It goes with so many outfits and makes the perfect fall accessory. I love it because it jingles, has the perfect amount of sparkle for that girly touch. My favorite piece of jewelry is the turquoise cuff my husband got me on our one year anniversary. We got married in Yosemite and went back on our first anniversary. That’s where he found the stunning cuff made by local native American jeweler. I’ve been a JM member for a few months now, and I have to say the quality of their pieces is amazing! But of all of the jewelry I own, my favorite has to be a tiny silver charm that has “OM” written on it. I bought it during a bad time in my life and now I constantly have it on, a reminder that no matter how bad things get, breathing is the only way to move forward. I,’m already a memeber of Jewelmint also I’ve also like them on facebook. And I’ll have to say one of my favorite piece of jewerly is the silver zip bracelet from jewelmint I love it a lot! My most worn piece! That’s just 1 of my favorite I have several! Love all of my Jewelmint! I am in love….with Jewelmint that is! My favorite piece of jewelry is my 2ct. diamond stud earrings. They go with EVERYTHING!! I wear them to work with a suit jacket, to weddings with dresses, or just pair them up with a t-shirt and jeans for a casual weekend. My FAVE piece at the moment is Jewelmint’s Nordic neclace; boho, chunky, playful and unique! I love jewelry that stands out in the crowd and this does. i love jewelmint! my favorite piece would be the cosmic fusion because it is soo unqiue!!! I really like the Setting Sun necklace..I hope they will re-release it again soon, but for now i really enjoy my Borgia ring and is planning on getting the Payal Belle bracelet or Hayden Necklace! my favorite piece is the hayden necklace. it’s just so unique and looks like a little piece of treasure. My favorite piece is the Poseidon pendant! Yay! what an awesome giveaway! thank you! My very most favorite piece(s) of jewelry are my 1920’s flying liberty earrings/necklace. they were cut from a liberty dime and represent freedom of thought. they were given to my mother by my father when they were first dating (over 37 years ago) and i love them to pieces! What a great giveaway 🙂 I dont have anything jewelmint yet but plan to pretty soon! My favorite piece of jewelry is my wedding ring because it was also my moms!!!! My favorite jewelry piece is a white gold “Carrie” necklace (with my name as a pendant). It was given to me by my step-mom. I love it and I get many comments when I wear it. It goes with my Mumbai bracelet which is my second favorite piece of jewelry. I am totally addicted to JewelMint, with many fave pieces from them, but my one piece of jewelry that I couldn’t do without is my simple wedding ring. My husband (to-be, then) had had the gold wedding band from his previous marriage hiding in the corner of a drawer for years. I decided to transmute it, and we had a local jeweler stretch it out and wind it with silver, and then use that spiral-y wire for the new wedding rings for my hubby and I. Mine is very thin, his thicker and more manly, but otherwise they match exactly. They’re actually from one year after the wedding, because our three-dollar rings from India turned his skin green. We did consecrate them on our first anniversary by saying our vows again, and he cried! My favorite piece of jewelry is the sweetheart ring. I wear it like, everyday! I LOVE jewelmint and wear it almost everyday! I often will decide which piece(s) of Jewelmint i want to wear and pick my outfit around it! 🙂 I I cannot pick one favorite, but tied for favorite are the Hayden necklace because it is such a beautiful everyday piece and potion pendant because its so lovely and I wear so much green and purpley-pink that it goes with so much. My favorite piece of jewelry is a pearl ring my aunt gave to me several years ago. When my father was serving in Vietnam, he purchased the ring for her over there, and then on my 16th birthday, she’d had it reset in a beautiful gold setting and presented it in a beautiful little box. Underneath the foam cotton displaying the newly reset ring was the original band, small and tarnished. I cherish it always. My favorite piece of jewelry is my new pair of hoops. They were only 3 dollars but they look gorgeous with everything! My favorite piece of jewelry is my silver James Avery ring that I’ve worn literally everyday for the last 4 years. If I don’t wear it, I feel naked!! My favorite jewelry piece of all time is a fan necklace that my grandmother gave to me. It’s a pendant of a large purple fan that opens to become a mirror. My Mother got it for my Grandmother while she was teaching there in the 70’s. I love Jewelmint pieces also, mostly because their pieces’ designs are always so unique. Even though there are many copies of the jewelry, I always feel like mine is one of a kind. My favorite piece of jewelry is a colored pearl set my husband got me for my birthday and mother’s day gift a few years ago. I love the quality and how dainty it is. Thank you for this giveaway! My favorite piece is actually one of my first JM pieces; the bronze zip. Goes with everything, the silvers ones in the mail! LOVE!!! Thanks for the give away! I have been a Jewelmint Fan on FB for awhile so I’ve already liked and have an account. Now that specifics are out of the way 🙂 Thanks for hosting this giveaway! I have to say my Fave JM piece is Metal Mosaic ring. It just has an edge and fun feel to it that allows me to dress up and down an outfit. It is a one of a kind. My favorite jewelry piece has to be the silver key necklace with a heart base and a rose wrapping around the blade (a lot of people say that it reminds them of the Key Blade from Kingdom Hearts). I got when I went on my very first exchange program to Japan and I wear it everyday as a reminder of all the memories and friends I made in those two weeks there (and because it goes with everything, lol). I signed up for Jewel Mint! Thanks for the giveaway! My favorite piece of jewelry is my black pearl strand. It’s classic pearl necklace in a unique color, classic but kind of edgy. I also liked Jewel Mint on FB! Leave a comment to Celeste T.